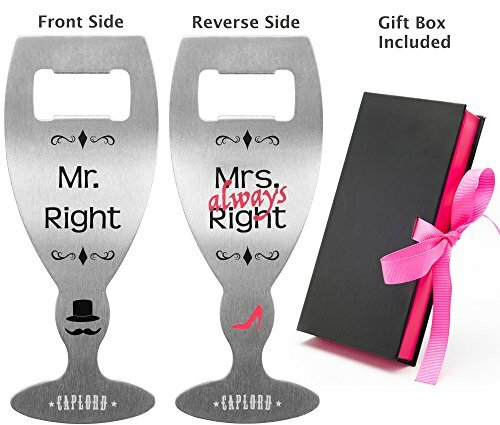 If you want a novelty and funny gift idea for couples…our Mr. Right and Mrs. Always Right bottle opener is the answer. Give them what they deserve…The best! This is a unique gift for a wedding, bachelorette/bachelor party, for groom & bride, or on other occasions for men and women, that is completely different and guaranteed to bring some fun and laughter. Aside from the humorous gesture, this funny wedding gift will serve a practical purpose in the home of the newlyweds or outdoor at picnics. This beer glass shaped stainless steel bottle opener is unbreakable, sturdy and made to last a lifetime. The CAPLORD bottle opener comes in a black & pink unbranded gift box, with a pink ribbon and a black velvet foam inlay, making it the perfect gift. Are you looking for the perfect bridal shower gift for a bride you know she’ll love? Look no further! Regardless of the occasion, they are absolutely going to love their gift.  PERFECT FOR ANY OCCASION YOU CAN THINK OF: bridal shower, birthday, first, 5th, 10th, 15th wedding anniversary, housewarming, appreciation, engagement, bachelor party, funny quirky gift, friendship present or any occasion for a gag gift!  GUARANTEED - We love our products, but we love our customers more. For that reason, we're offering a full LIFETIME GUARANTEE on every bottle opener we sell! If our product isn't performing up to your standards, no worries. Just let us know and we'll be there to fix the problem, from replacement to refund. SAVE UP TO 20% TODAY - Buy 2 or more. Scroll down to the Special Offers and Product Promotions area below to see DISCOUNTS. If you have any questions about this product by CAPLORD, contact us by completing and submitting the form below. If you are looking for a specif part number, please include it with your message.